Ariel Atkins drives the ball up court. 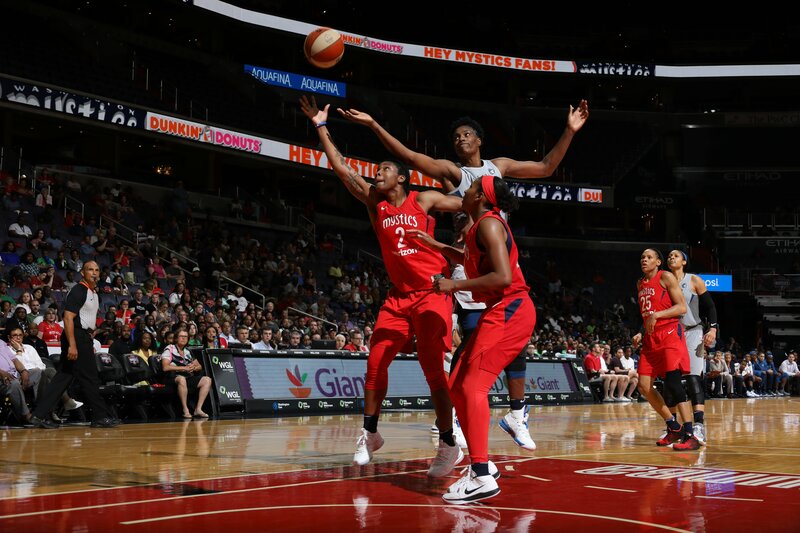 Photo courtesy of Washington Mystics. In a WNBA draft class that is already leaving an imprint on the league, Washington Mystics guard Ariel Atkins and forward Myisha Hines-Allen are at the front of the pack. 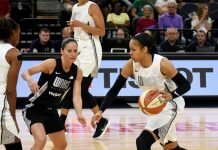 In a road trip that saw the team without three key players due to injury or illness, Atkins was inserted into the starting lineup and scored 18 and 21 points in her first two outings. Hines-Allen also stepped up, notching a double-double in one game and starting for the next match up. Eight games into the season, former Texas standout Atkins is averaging a solid 12.5 points per game while shooting 42.4 percent from the field and 39.5 percent from deep. 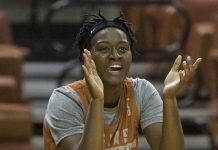 A threat on both sides of the ball, she’s also known for her defense: she made the Big 12’s All-Defensive team her in junior and senior years with the Longhorns. Hines-Allen, who helped guide Louisville to the Final Four two months ago, is averaging 6.6 points and 4.8 rebounds per game, making her the third-highest rebounder on the team behind All-Star Elena Delle Donne and Tianna Hawkins. Not bad for two players that many were surprised to see drafted so high. 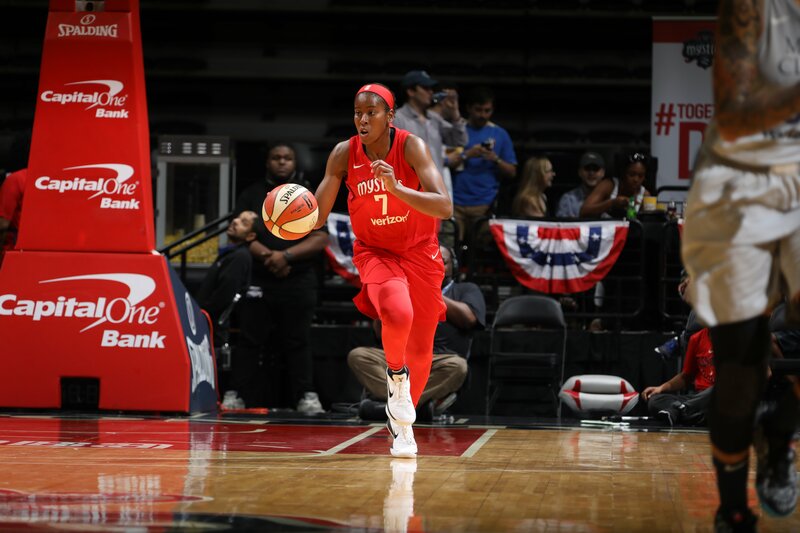 Neither athlete was invited to the draft, so Atkins was not on hand to march up to the podium and claim her jersey when Washington picked her seventh in the first round. They took Hines-Allen, who wasn’t included on some mock draft boards, at No. 19 in the second round. But if anyone is surprised that both players have hit the ground running in their pro careers, is isn’t coach Mike Thibault and his staff. The versatility of Atkins was a plus. Thibault was pleasantly surprised to see Atkins exceed his expectations. Myisha Hines-Allen battles Minnesota center Sylvia Fowles for a rebound. Photo courtesy of Washington Mystics. In the case of Hines-Allen, Thibault said he was “shocked and surprised” she was still available in the second round, as time to pick grew closer. 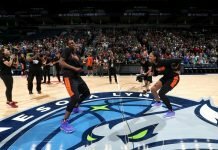 Hines-Allen impressed him with her preseason exhibition game performance against the champion Minnesota Lynx and reigning league MVP, center Sylvia Fowles. “She went up against Sylvia and she didn’t back down,” Thibault said. The newcomers aren’t the most outspoken people in the locker room or on the court, and yet, they carry themselves more like veterans than rookies. Both women exude a sort of quiet intensity, and have already become integral to the rotation in the third week of the regular season. But despite their early success, both Atkins and Hines-Allen said they are having to learn fast as they make their adjustment to professional play. Atkins is both gritty and composed on the court. “One of my strengths is my energy, being able to move on from one thing to the next and not get hung up on doing something wrong or something coach doesn’t want us to do,” she said. She also attributes that to the support she’s received from her more seasoned teammates. As for Hines-Allen, the biggest adjustment has been stepping into a different role: one where she gets to sit back and observe more than she’s ever been able to do in her basketball career. Her game has translated well from college to the WNBA, as she was a terror on the boards and the picture of efficiency in her four years for the Cardinals. She shot 53.2 percent from the floor and logged 1,144 rebounds over the course of her college career. In making the Mystics roster, Hines-Allen has realized a longtime dream, and she sees each match up as a new adventure. “I’m excited for every game because it’s a different learning experience every time, and seeing and playing against different players that you actually watched play growing up, and actually being on the same court as them is awesome,” she said. Tomorrow Washington hosts Minnesota, whom they beat May 27. Sue Favor contributed to this report.